If you went through the previous article, you saved updates to the Attachments & Links page. 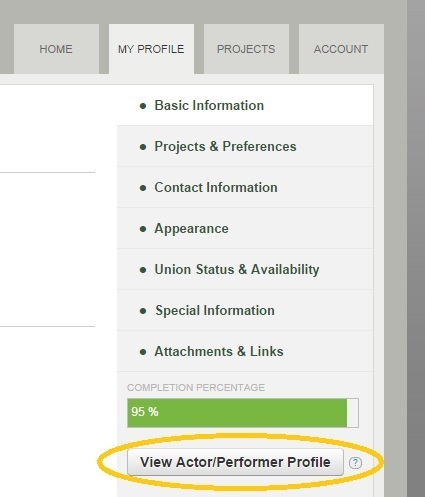 The next feature new to version 0.3, is not a field you need to update, but it has been one of the features most requested by actors since we launched last year: how do they see what their profile as the producers see it? Now you can, and there’s several different ways you can do it. 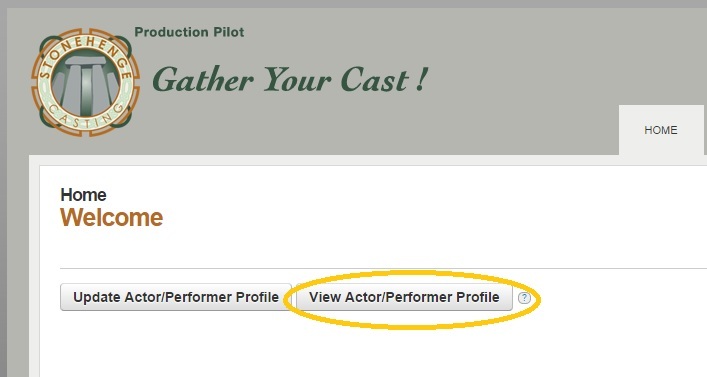 After you log in –and assuming you have created an actor/performer profile– you’ll see a link to view the actor/performer profile right on the home page. In addition, at any point in the while you’re updating your profile, you’ll notice that there’s a link to see the “producer’s view” at the bottom right of each profile page. Remember, you’ll need to save whatever changes you’re making to that particular profile page for them to show up on the producer’s view. In both cases, you’ll notice that your browser opens a new window or tab with what the producers see. If you already have that producer’s view open, refresh your browser whenever you make a change to see it reflected. We hope this, along with some of the other improvements in version 0.3 help you get better use out of Stonehenge.